With our thoughtfully appointed one and two-bedroom/two-bath condominiums, packing is a breeze. If you’re traveling to Sanibel during the winter months, or plan on boating, bring along something warmer, like sweatshirt, slacks, sweater or windbreaker or wrap perhaps. For further information on Sanibel Island weather, click through this link, Sanibel Weather. Beach chairs (two for one-bedrooms; four for two-bedrooms) are provided in each unit. Please note that we do not provide beach umbrellas or toys. These may be, however, individually provided by an owner. Umbrellas are available to rent locally. Bicycle Rentals (Adult Cruisers) are available at the Front Office, during normal business hours. Bicycles are not permitted inside units, patios or walkways and must be placed at bike rack(s) only. Gas Grills are easily accessible and located in three different areas of the. Grills are not permitted on patios. Linens and Terry: A starter set of fresh linens and bath towels, is provided. We do not replenish towels for stays less than one week. Complimentary laundry facilities are available should you desire to launder them during your stay. Additional Linens/Towels can be provided to you for an additional charge. Maintenance Service Requests are recorded in the Front Office. Should the need for maintenance occur in your unit, stop by or notify the Front Office immediately at 239.472.2275. Pool hours are from 9:00 am to Dusk and may be closed intermittently during your stay for cleaning. Absolutely NO night swimming. Consumption of any food/beverage or possession of any open container containing any food/beverage in the pool or about the pool ledge is prohibited. No glass containers shall be allowed in the pool area. Food/Beverages in paper, plastic or metal containers may be consumed in the lounging areas of the pool. 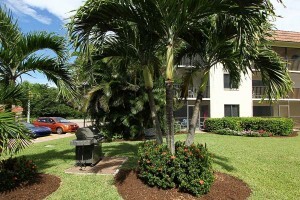 Pool/Beach Towels are provided and placed in your unit prior to arrival. A maximum of two additional pool towels may be obtained at the Front Office and will be distributed as per the number of guests registered in our system. Shuffleboard & Tennis: 9 a.m. to DUSK. Tennis Rackets and Tennis Balls are available for checkout in the Front Office. Skateboards, in-line skates and similar items may not be used on any part of Sandalfoot property. Small Appliances such as hair dryers and irons are also provided for your convenience. Starter Kits are complimentary and contain toilet tissue, paper towels, trash bags, coffee, creamer, filters, dish washing detergents & bath soap. Once you have run out of these items, you will need to make arrangements to purchase whatever items you need for the duration of your stay. Wireless Internet (high-speed) is complimentary, available to all registered Sandalfoot guests and will work with any Wi-Fi enabled device. You assume full responsibility for insuring your computer is secured and you agree to hold harmless Sandalfoot, its employees and owners if your computer becomes unusable due to use of this service. Sandalfoot is not responsible for service interruption or unavailability.